I love making (crustless) quiches. I’ve made a bunch of them over the past few years, with a quite a few varieties – veggie only, veggie and cheese, apple and sausage, etc. But lately, I’ve been seeing recipes for “strata,” which basically sounded like a crustless quiche with bread cubes on the bottom (although I think with the name, it’s supposed to be in layers). Here’s a spinach and cheese strata recipe from Epicurious, for example. 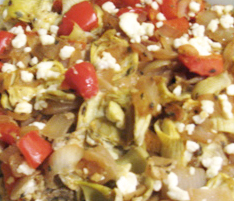 This strata idea sounded interesting, so I made a single layer strata with caramelized onions, red peppers, artichokes, and goat cheese. Wow, was it good!! The egg-soaked bread is just so delicious, and combined with everything else – I can’t wait to have more of it. Yum. Spray the container you will be cooking in with the oil. 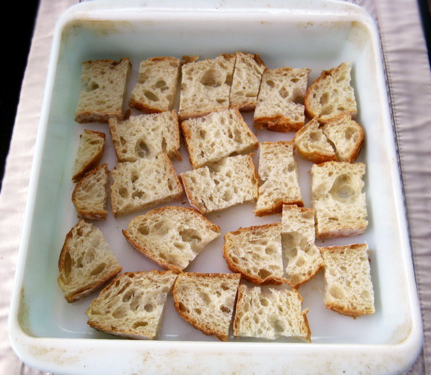 Cut up the bread into cube-ish pieces and place in container (as shown at right). Cut the onion and caramelize (medium-high heat, stirring, deglazing occasionally). Cut the red pepper and add that in with the onions after they start caramelizing but before they are done. Set this aside to cool. 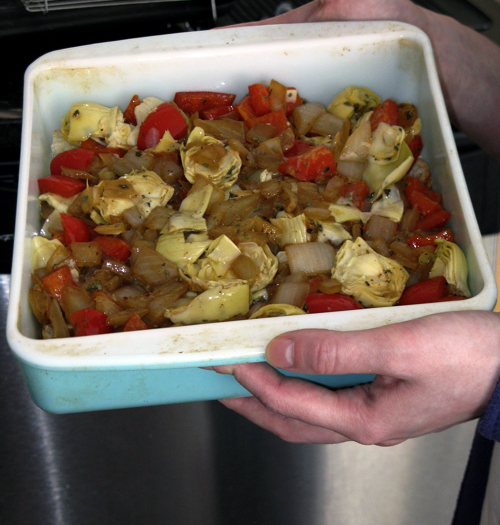 Rinse the artichokes (as the canned ones usually have a lot of salt with them) and chop. I chopped off the ends and cut each of them in halves or quarters. Break the eggs (3 eggs and 3-5 egg whites) into a container and whisk. 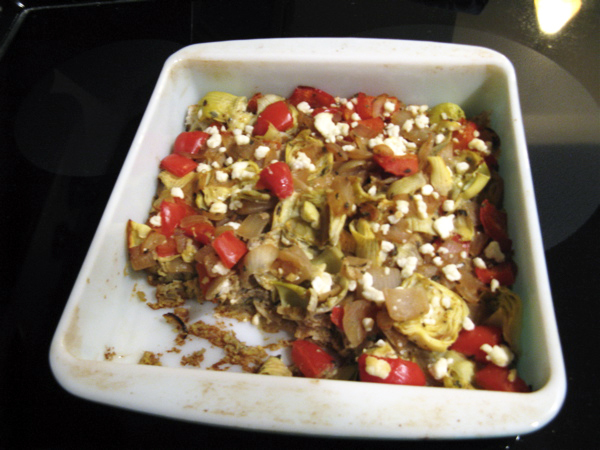 Throw in the red pepper and onion mix, and the artichokes. Add whatever spices/herbs you like. Stir to combine. Pour the egg mixture on the cubed bread, cover the container with foil, and place in the fridge for a few hours (or however long you have – I’ve seen recipes say anywhere from 20 minutes to overnight). When you are ready to make it, heat the oven to 375 degrees Fahrenheit. Take out the container and add goat cheese sprinkled on top. Place in oven for about half an hour, till it is set – check with a toothpick or cut into it to be sure. It smelled so good, I forgot to take a picture before I dug into it!